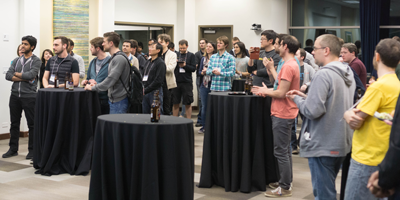 On the weekend of February 6th and 7th, 2016, researchers and students from different institutions around the world are invited to gather and participate in the first CAIDA BGP Hackathon at the San Diego Supercomputer Center at UC San Diego in La Jolla, CA. The hackathon is sponsored by industry, professional organizations, and government agencies, with interest in promoting the development of tools to model, measure, and monitor the routing infrastructure of the Internet. Application does not guarantee participation. There is no application fee, and no participation fee. Application to participate in the first BGP Hackathon is closed as of January 11, 2016. 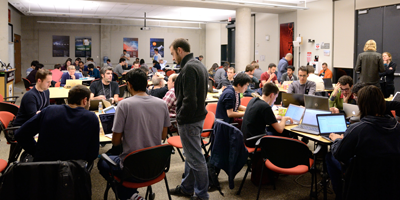 Due to the overwhelming interest in the hackathon, we have reached capacity for the hackathon. We are no longer accepting applications for this year's hackathon. The event is scheduled just before NANOG 66 in San Diego. 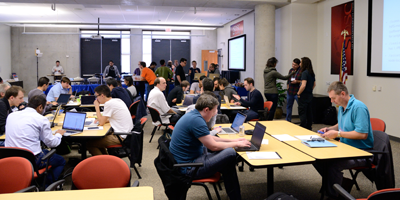 The hackathon also precedes the CAIDA AIMS workshop, which will also be held at the San Diego Supercomputer Center on the UC San Diego campus. 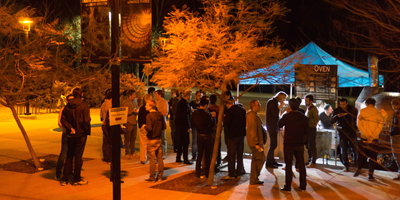 CAIDA, in cooperation with CSU, USC, UFMG, FORTH, Route Views, RIPE NCC, will host a BGP Hackathon on the 6-7th of February 2016 at UC San Diego (La Jolla, CA, USA). The theme of the hackathon is "live BGP measurements and monitoring." We will provide participating teams with access to data sources and a toolbox: live streaming of BGP data, the new BGPMon interface, BGP processing tools and APIs such as the opensource BGPStream software framework, the PEERING testbed, RIPE RIS, visualization tools, and data-plane active measurement platforms such as CAIDA Ark and RIPE Atlas. Participating teams will work on "challenges" that extend, integrate and demonstrate the utility of these platforms/data for understanding or solving practical problems (e.g., detecting BGP prefix hijacking, evaluating anycast performance, effectively visualizing phenomena). provide extra incentive for students to attend NANOG. The platforms will be pre-installed on the new Comet Supercomputer at the San Diego Supercomputer Center. The participants will have an account on the system. Each team of 2-4 people will work on a "challenge". The organization committee will propose a set of challenges to bootstrap feedback and refinement based on community input: participants can propose totally new challenges, modifications to existing ones, and express their preferences. The set of potential challenges is described at List of Challenges on the Hackathon Wiki, and will continuously evolve in the days preceding the hackathon. On Saturday morning, participants will very briefly introduce their interests and ideas and teams will be officially formed. On Saturday and Sunday, participants will work together in teams to hack and develop their ideas, culminating in very short presentations to the jury on Sunday evening and a party to announce the winning teams and celebrate everyone's participation. During the event, domain-experts will provide support to the teams. 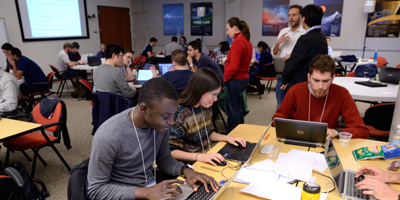 Participants are free to work on drafted challenges and on their own ideas in the days preceding the hackathon. A mailing list and documentation will provide support on the platforms/tools/data used in the hackathon. However, for the teams to compete in the hackathon for prizes, they will have to demonstrate that substantial work was done during the two-day event. Food and drinks will be provided throughout the two-day event. Please note everyone entering the building during the hackathon will need to be registered and pre-approved, and will be required sign a University campus liability waiver on check-in. The agenda is posted on the BGP Hackathon Github Wiki. 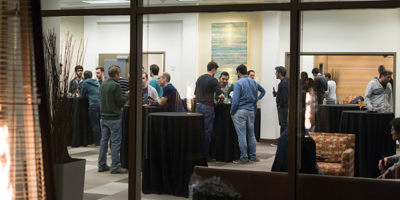 The CAIDA BGP Hackathon was a success. All fifteen teams made significant work on their projects and their results were presented. The results of the BGP Hackathon are posted on the BGP Hackathon Github Wiki, and actual project files and presentation slides are made available at the BGP Hackathon Github page. The final report of the BGP Hackathon also details the results of the event. While meals will be provided throughout the event to all attendees, a limited number of travel grants will be awarded to applicants who need it for flights and hotels. Financial support to enable this has been generously provided by our sponsors. The deadline to be eligible for a travel grant has passed, and travel grants are no longer available. Travel grants will reimburse actual expenses up to a maximum of $600 for domestic airfare, or $1400 for international airfare. There are specific airfare restrictions in place (most economical fare, American carriers only per the Fly America Act) to qualify for reimbursement. We are unable to reimburse transportation costs for this hackathon. Attendees are responsible for any expenses from transportation between the airport and their hotel, as well as between their hotel and the hackathon. Travel grants include hotel accomodations that will be reserved and paid for directly by CAIDA. A block of rooms will be at a nearby hotel for a Friday night check-in and a Monday morning check-out. We are unable to provide hotel reimbursements for hotels booked directly by the attendees. We will be pairing up attendees together in a two-bed room. Indicate in the comments of your application or write to CAIDA's bgp-hackathon-info email if you have any preferences or concerns that need addressing. The hotel block is full. Attendees will have to make their own hotel arrangements. For those who will make their own hotel arrangements, see the Local Hotels list (PDF). Contact the hotel directly for updated pricing, parking, and shuttle information, and be sure to ask for the UCSD Corporate rate on the phone (not available with online booking). We will not be able to provide travel reimbursement for any hotels. 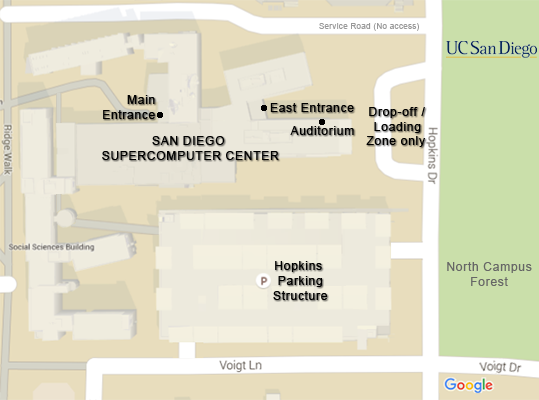 The BGP Hackathon is being held in the SDSC East Auditorium (Room B210E/B211E) that faces Hopkins Drive. We are unable to reimburse transportation costs for this hackathon. The options below are just for reference. Campus Shuttle: Campus shuttle will NOT be available during the hackathon. Parking Permits: Parking permits are usually required to park on UC San Diego Campus. Permits are not required for weekend parking in A, B, S, and V spaces. It is recommended you go to the Hopkins Parking Structure next to SDSC and park on the lower levels. 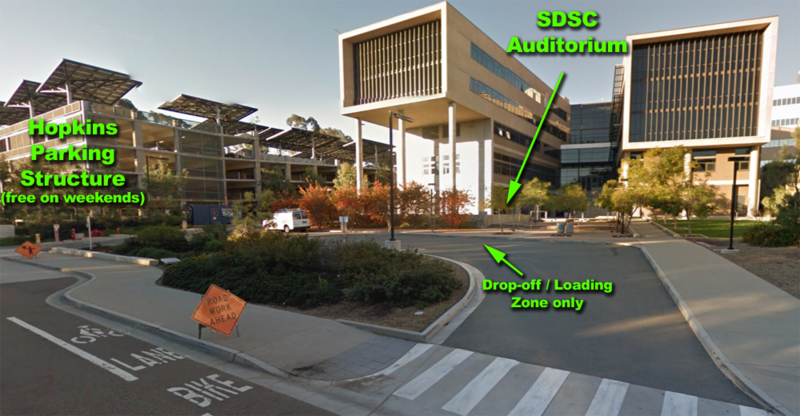 Walk to the street-side of the parking garage (level 2), and along the street to the SDSC East building. The auditorium is on the left just before the stairs, labeled Auditorium or B210E/B211E Meeting Room. Note that the Main entrance and east entrance will be locked on the weekends, so you will have to approach the auditorium from the street level.